Does anyone remember the children's periodical Olomeinu - Our World, published by Torah Umesorah? Perhaps you remember Mendel the Mouse, or the interesting easy-Hebrew article, or the cartoon on the back page (as I recall, somehow it always featured a yeshiva bochur going to Odessa on a train). Perhaps your children receive a copy monthly. My friend asked what my thoughts were. I remarked that it reminded me of a Chick tract (for a classic Chick tract, click here : Where's Rabbi Waxman?). I then said that I wondered if this sort of cartoon is something new for Olomeinu, or perhaps these sorts of polemical messages basically flew over my head as a child** (related). Anticipating that each of these points may be subject to dispute in the comments, let me just say that the reason why I think these messages are intended is basically because this is a story which was made up. 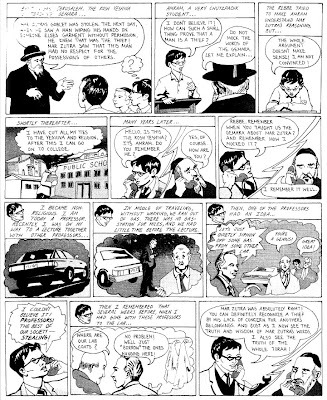 The cartoonist was free to create any scenario, including one in which the boy who questions becomes a rosh yeshiva rather than irreligious. That's why it's similar to the Chick tracts. All in all, this little gem is not half as interesting as the pearl unearthed by Blog in Dm. All in all, I'm sure there will be an article devoted to these rare pieces of early 21st century Judaic ephemera in the American Jewish Historical Society journal. Perhaps I'll even rate a footnote. *Who will be named, either by first or both names, or initials, if s/ he wishes. ** I honestly don't remember message of this sort, but I suspect that this isn't a new cartoon, but a reprint. Some things about it smells 1970s and not 2000s. The wise Iyov has tagged me. Find the first 5 sentences. Post the next 3 sentences. Although I am not supposed to cheat, I will cheat...a little. I'm going to have two entries. The first is, literally, the closest book I picked up. The second is also a book, it's also the first I opened in a blind search--but I have it in PDF. This book [ie,Tychsen's Tentamen de Variis Codicum Hebraeorum... 1772] sought to undermine Kennicott's project by questioning the criteria by which biblical manuscripts were chosen and evaluated, as well as the quality of the manuscripts themselves. Tychsen was roundly criticized by a number of scholars, which in turn prompted him to publish a defense in 1774. Mendelssohn seemed to be keenly aware of the controversy over Tychsen's work and the climate that bred such a reaction, and he made it clear where his empathy lay. Edward Breuer, The Limits of Enlightenment: Jews, Germany and the Eighteenth-Century Study of Scripture, pg. 123.
" which we render woman. Norman Sievwright, The Hebrew Text Considered; Being Observations on the Novelty and Self-Inconsistency of the Masoretic Schem of Pointing the Sacred Hebrew Scriptures, 1764. pg. 124. Other than changing the long S to our standard lowercase s (eg, I observe, rather than I obferve) I preserved the formatting of this book exactly, since it captures some of the...charm? history? to see such antiquated printing conventions as, for example, the means of quotation. Why is my quote from pg. 124? Because Sievwright was so wordy and Germanic, that the 6th, 7th and 8th sentence from the beginning of pg. 123 is on pg. 124! I tag Ari, Ishim, Dave, Gil, and Menachem. For more on R. Heller, see. Prof. David Halivni has won the Israel Prize for research into the Talmud for 2008, the Education Ministry announced Tuesday. Halivni has written seven volumes of critical research on the Talmud. He has taught at Columbia University in New York for many years and made aliya to Jerusalem in 2005. Halivni currently also teaches at both Bar-Ilan University and The Hebrew University of Jerusalem. Halivni was born in the Ukraine in 1927. He received smicha at the age of 15 and was the sole survivor of the Holocaust from his family. According to the judges, "Prof. David Halivni is one of the premier researchers into the Talmud of our generation. He merges the old with the new pioneering new methods of research," the judges, Profs. Daniel Sperber, Shlomo Naeh, and Aharon Kirschenbaum said. Download and read the very interesting New York Times Magazine profile "A Life in the Talmud," by Israel Shenker, 9.11.77: here. Some of the greatest feats in printing history were achieved with the polyglot Bibles of the 16th and 17th century. 1) Hebrew (with Latin translation), 2) the Latin Vulgate, 3) the Greek Septuagint (with Latin translation), 4) the Syriac Peshitta (with Latin translation), 5) Targum Onqelos (with Latin translation), 5) Samaritan Hebrew, 6) Samaritan Targum (with Latin translation), 7) Arabic (with Latin translation). Parts of the Bible have Ethiopic and Persian versions. As a child I enjoyed doing cryptogram puzzles. I possessed some disconnected knowledge in history, astronomy, and other mathematical sciences. I burned with desire to acquire more knowledge, but how was this to be accomplished in the want of guidance, of scientific books, and of all other means for the purpose ? I was obliged therefore to content myself with making use of any help that I could by chance obtain, without plan or method. In order to gratify my desire of scientific knowledge, there were no means available but that of learning foreign languages. But how was I to begin ? To learn Polish or Latin with a Catholic teacher was for me impossible, on the one hand because the prejudices of my own people prohibited to me all languages but Hebrew, and all sciences but the Talmud and the vast array of its commentators, on the other hand because the prejudices of Catholics would not allow them to give instruction in those matters to a Jew. Moreover I was in very low temporal circumstances. I was obliged to support a whole family by teaching, by correcting proofs of the Holy Scriptures, and by other work of a similar kind. For a long time therefore I had to sigh in vain for the satisfaction of my natural inclination. At last a fortunate accident came to my help. I observed in some stout Hebrew volumes, that they contained several alphabets, and that the number of their sheets was indicated not merely by Hebrew letters, but that for this purpose the characters of a second and a third alphabet had also been employed, these being commonly Latin and German letters. Now, I had not the slightest idea of printing. I generally imagined that books were printed like linen, and that each page was an impression from a separate form. I presumed however that the characters, which stood in similar places, must represent one and the same letter, and as I had already heard something of the order of the alphabet in these languages, I supposed that, for example, a, standing in the same place as aleph, must likewise be an aleph in sound. In this way I gradually learnt the Latin and German characters. By a kind of deciphering I began to combine various German letters into words ; but as the characters used along with the Hebrew letters might be something quite different from these, I remained always doubtful whether the whole of my labour in this operation would not be in vain, till fortunately some leaves of an old German book fell into my hand. I began to read. How great were my joy and surprise, when I saw from the connection, that the words completely corresponded with those which I had learned. 'Tis true, in my Jewish language many of the words were unintelligible ; but from the connection I was still able, with the omission of these words, to comprehend the whole pretty well. 1 "Solomon Maimon: an Autobiography: Tr. from the German with Additions and Notes," translated by John Clark Murray, 1888, pp.89-91. If you don't have time or interest in reading the entire autobiography, you can read what is essentially an 18-page synopsis (with interesting commentary) here, in an essay from 1895. Inspired by Menachem Mendel's post Google’s Jewish Books, I will list some of my own discoveries on Google Books and other useful e-books freely available online in other places which are more difficult to find (I don't consider browsing JNUL or Hebrewbooks.org terribly difficult). I will (probably) only list books that are in English or Hebrew, although there is obviously potential wealth in other languages. 2) Joseph Derenbourg's edition of Saadiah Gaon's Tafsir (1893). 3) Moise Schwab's Talmud Yerushalmi Berakhoth, English translation of the French (1886). 4) Abraham Berliner's edition of Rashi (1905). 5) Leone da Modena's autobiographical Ḥaye Yehudah. 6) Yasha"r Reggio's edition of the aforementioned Leone da Modena's Behinat ha-qabbalah, with Qol Sakhal and Sha'agat Aryeh. 7) Nachman Krochmal's More nevukhe ha-zeman. 8) Hayyim Yoseph David Azulay's Shem ha-gedolim he-ḥadash. 9) Samuel David Luzzatto's Isaiah with Italian translation and comentary, 1867. 10) Yom Tov Zunz's Namen der Juden (see, I've already violated my Hebrew/ English quasi-rule). 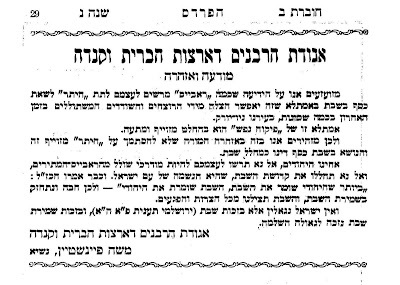 12) Ḥayyim Heller's Al Targum ha-Yerushalmi la-Torah (1921). 13) Simcha Pinsker's Likute Kadmoniyot. Much more to come, I think. Also, please note that the time is short for me right now. I will edit this post with more information about the names and works in this post. This book seems to have originally been published in 1933 as Licht aus dem Western, seemingly by the original Agudath Israel (Agudas Jisroel-Jungendgruppe) and the present work is the translation into English from 1969, by Joseph Leftwich. In any event, this excerpt concerns R. Nathan Adler (this one, not this one) and Wolf Heidenheim. You can find tasty blogging fodder for years by mining the Ha-pardes archives (as Krum discovered years ago, see. [Here is an] "announcement by Agudas ha-Rabbonim, which appeared in Ha-Pardes, November 1975. "Yet the beautiful thought which the learned rabbis assume was stated by Hazal was actually stated by Ahad ha-Am, and is perhaps his most famous saying. However, for one whose only Jewish knowledge comes from the yeshiva, this information would be unknown, and it is easy to see how such a statement (“more than the Jews have kept the Sabbath the Sabbath has kept the Jews”) could “infiltrate” this closed world and become just another ma’amar hazal." While this is not the same thing as a statement by the Agudas Ha-rabbonim calling a ma'amar Ahad Ha'am a ma'amar Hazal, I recall a few years ago a rabbi quoted this aphorism (without attribution to Hazal) in the Country Yossi Family Magazine. A reader sent a letter saying what the source was and that therefore the statement was wrong. The rabbi responded that whoever said it, it's true! a. The study of ancient writing and inscriptions; the science or art of deciphering and interpreting historical manuscripts and writing systems. 1806 A. CLARKE Bibliographical Misc. ii. 202 (table) Literary, ancient, modern, Bibliography, Paleography. 1840 Penny Cycl. XVII. 149/1 The study of antient documents, called by modern antiquaries ‘Palæography’. 1859 T. J. GULLICK & J. TIMBS Painting 100 The art of deciphering ancient writings, or palæography. 1885 SIR E. M. THOMPSON in Encycl. Brit. XVIII. 143 Palæography is the study of ancient handwriting from surviving examples. 1894 Oxf. Univ. Gaz.24 412/1 Medieval Latin palaeography and diplomatic. 1963 Trans. Cambr. Bibliogr. Soc. 3The English usage whereby palaeography is taken to include, as a matter of course, every aspect of the manuscript book..is worth keeping. 364 1980 N.Y. Times (Nexis) 4 Aug. A18/1 She..received an M.A. degree in medieval Latin and paleography from University College of the University of London. 1994 Times 14 Apr. 19/3 He was a student of palaeography with Lowe... He displayed exceptional acumen in the study of early bookhands. 8. The stylistic changes are caused by a variety of factors, of which the following are most important: time and place, the writing materials and implements, the speed of writing, and the influence of imitation of other scripts. a. Time. A script, like a language, changes in the course of time, even when a tradition is strictly followed. A minimal change may develop a dynamic of its own and gather momentum in a certain direction, thus influencing the evolution of the script. Sometimes a change in the letterforms is temporary, leaving no trace in the script's subsequent development, as in the case of the idiosyncrasy of a certain scribe. Changes that become systematic are, as we said, stylistic changes. One of the major changes in a script - one which develops slowly - is the change in the relative size of the letters of the alphabet. Thus, for example, there is a difference in the relative size of the letter-signs in the script of the early scroll fragments from Qumran and the script used in manuscripts two centuries later (quite apart from other formal changes in the script). Rapid changes in the letter-forms are generally due to fluent writing with ink. Scripts of different degrees of cursiveness may sometimes be used for different purposes, such as writing official documents as against private letters. Script-styles constantly change and the situation is never static. b. The nature of writing materials and writing implements. Letters of one and the same script-style will have different appearances when written with different instruments on different surfaces. There is a difference between writing in ink on a soft surface and inscribing letters on a hard material. The writing implement, whether a brush, or a reed-pen, a quill, a chisel, etc., and the way the implement is cut and held, also influence the form of the letters. A careful examination of their inner structure will reveal the common features of the letter-forms. On the other hand, the use of different implements and materials can result in formal changes in the script which can become stylistic. Thus, for example, it is difficult to draw horizontal strokes from right to left or vertical strokes in an upward direction with a flat writing implement held in the right hand, while such strokes are easily made with a sharp or round writing implement. A flat pen, unlike a sharp or round pen, can be used for writing letters with thick and thin strokes and ornaments, which may become stylistic features of that particular script. c. The speed of writing. Writing on soft surfaces, unlike writing on a hard material, usually encourages flowing movements which may cause rapid changes in the form of the letters. Already in ancient times, a reed-pen or brush was used for writing in ink. As a result of this fluent writing, the forms of the letter-strokes as well as their meeting points and the forms of their joints underwent fundamental changes. The lapidary script usually continues to exist together with the cursive hands and there was a mutual influence on their letter-forms; cursive found their way into the lapidary script and vice versa. This process gave rise to a large variety of letter-forms of different degrees of cursiveness, and cursive and semi-cursive script-styles emerged which were sometimes used concurrently for different purposes. d. The geographical factor and the influence of imitation of other scripts. The Jewish script, and later the Hebrew script, evolved many styles due to contact with foreign scripts. Already before the dispersion of the Jews throughout the world, the Jewish script came into contact with the Greek and Latin scripts as well as the Nabatean script. In later times many new script-styles evolved among the Jewish communities in the different countries, with the influence of the foreign scripts as well as the use of different writing implements and materials. The changes in the letter-forms were sometimes due to deliberate imitation and they sometimes occurred unintentionally, mainly because the continual use of foreign scripts together with the Hebrew script occasionally caused changes in the hand-movement of bilingual scribes. Thus the Hebrew scripts in the Islamic countries show affinities with the Arabic script while the Hebrew scripts in Christian Europe show affinities with the Latin script-styles used in the different countries. The more strict the scribal tradition was, the less recognizable were the changes. Thus, for instance, in the calligraphic square Hebrew script which was used for the writing of sacred texts from the 9th century onwards, minimal changes occurred in the course of times, while the cursive and semi-cursive script-styles, which evolved at about the same time, show considerable changes in the form of the letter-signs. However, even the calligraphic square scripts used for sacred purposes underwent stylistic changes. Thus the number of ornamental additions increased as well as the variety of letter-f0rms of the joints between the letter strokes. Ada Yardeni, The Book of Hebrew Script: History, Palaeography, Script Styles, Calligraphy & Design, 2002, pp. 139-143. A little-known zeikher vs zekher issue; Franz Delitzsch, Wolf Heidenheim and the Mishnah Berurah. Every year around this time (or, more usually, in a couple of months) the issue of the proper pronunciation of the word זכר (Ex. 17:14) is raised. Five points =זֵכֶר vs six =זֶכֶר. I assumed I had done a post about this, but searches revealed that I didn't, and I was shocked. There is little to add to a topic that is of great interest to Judeo-nitpickers like us (discussed on the mail lists here, here and here (sort of). It's been discussed on blogs too, see here. There is also a very good lecture by Dr. Sid Leiman here--if the audo is still active--' Major Implications of Pronounciation Controversies'). This topic presumably fascinates those who it fascinates because it would seem quite amazing that a verse which the Talmud itself discusses as being prone to misunderstanding based upon an erroneous pronunciation (see here) would then become subject to confusion as to proper pronunciation (although it is important to recognize that there is no practical difference in meaning between זֵכֶר and זֶכֶר). The second factor might be that this confusion led to such a far-reaching but very late change in practice. So there is no need to add more, but actually, before I go on I will add one thing. Here in America many Orthodox Jews have become accustomed to the reading of this verse twice, to accommodate both possible readings (something which seems to be first recommended by the Mishneh Berurah (685:18)1 apparently based on the doubt about what the Gaon of Vilna read). In any event, this is obviously not the little-known zeikher vs zekher issue of the title. What is little-known is that the exact same doubt exists for Proverbs 7:10; זֵכֶר צַדִּיק לִבְרָכָה. Apparently the manuscripts showed five and six points for this verse as well. It seems that a similar confusion exists in Ashrei (see here). If anyone has the time, feel free to track down images of Proverbs 7:10 as found in various editions available online. 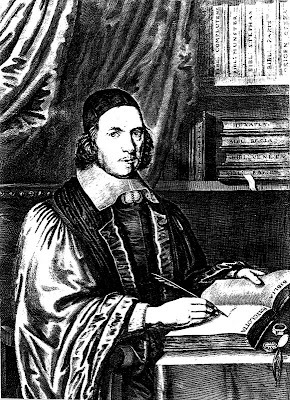 2 Delitzsch was relatively unusual as far as Christian Hebraists of the 19th century went in that he was very well read in contemporary and recent Jewish Hebrew literature and commentaries. He was a big advocate of the excellence of the commentaries of Shadal and Malbim (and was personally in correspondence with the former). Not only was he familiar with all the work of Wolf Heidenheim, but also the Gaon of Vilna, whom he cited. With this description, it shouldn't be a surprise that he was a welcome font of philo-semitism in the 19th century world of German Bible scholarship. Hebrew origin for Latin and Greek words in R. Azariah dei Rossi's Me'or Enayim. This is a very interesting excerpt from chapter 57 of R. Azariah dei Rossi's controversial but classic Me'or Enayim. "Also, among the works of scholarship by Rabbi David Provençale1, that flag-bearer of Torah from Mantua (lit. Min-tova; of goodness in Hebrew), is Dor Ha-felagah, in which more than 2000 Hebrew words that became incorporated into the Latin, Greek and Italian languages are given. "An example in Latin is uxor (wife) from ezer ke-negdo (helpmeet), axillae (armpit) from atzilei yadai (my arm joints). "The Greek and Latin pellex (concubine) comes from Hebrew pilegesh. Ospedale (hospital) comes from osef dalim (gathering of the indigent). "Calliope, the first of the nine Muses, the Muse of music, is from qol yafeh (beautiful voice), according to the compiler of the Latin dictionary.2 He also says that the word kalendae comes from qol, as I wrote earlier. "Accademia is from the words beit eqed ro'im (shearing house of shepherds), which Targum Jonathan translates as "a meeting house of shepherds"--and from adam (man), thus meaning a gathering of people. "I gave this explanation regarding an chevras chachomim (academy) recently founded here in Ferrara. The first lecturer described this institution as an "academy," and someone didn't like that description, since it would be strange for a Jewish society to bear a Greek name. And then I told him that the word might have been derived from Hebrew, and he was satisfied and appeased. " 1 Although this work is not extant, Steinschneider refers to it here. 2 In Joanna Weinberg's wonderful annotated translation of Me'or Enayim, she identifies this citation as Ambrogio Calepino, Dictionarium, s.v. Calliope. The twins were separated at birth and not told they had any siblings. They were adopted by different families, and - amazingly - as adults they met, fell in love and married. The High Court ruled the marriage had never been valid and annulled it. Further details of the case, and the identity of the twins, have been kept secret to protect them. Professor Lord Alton, who uncovered the case, said: "The right for children to know the identity of their biological parents is a human right. "There will be more cases like this if children are not given access to the truth." R. Hirschenson's responsum on Bible criticism; an Orthodox road not traveled. There is a very interesting responsum by R. Hayyim Hirschenson (occasionally referred to in the j-blogosphere; possibly first called attention to by R. Louis Jacobs) on the question of Bible criticism. "One of the most original thinkers among the Rabbis of the older school, Rabbi Hayyim Hirschenson, wrote some years ago a fascinating Responsum on the Jewish attitude to Bible Criticism. Hirschenson, who was asked if Bible Criticism may be taught at the Hebrew University, endeavoured to apply Halachic method to the problem. The Halachah knows of three categories with regard to liability—these are, hayyabh, 'obligation', i.e. the incurment of a penalty; patur 'exemption' but assur 'forbidden', i.e. though there is no penalty for the offence there is prohibition; and patur and muttar, 'exempt and permitted', i.e. not only is there no penalty but there is no prohibition. With regard to Sabbath law, for instance, work prohibited in the Bible involves the full penalty of Sabbath desecration; work forbidden by rabbinic law is prohibited but there is no penalty attached to the prohibition; and there are certain forms of work involving no prohibition whatsoever. Hirschenson suggests (Maiki Ba-Kodesh, Vol. I and II, St. Louis, 1919-1921) that the main objection in the Talmudic sources to the rejection of the doctrine of 'Torah from Heaven' is that such a rejection impugns the honesty of Moses by suggesting that he wrote something he had not received from God. The hayyabh offence in this field, for which the penalty of exclusion from the World to Come is incurred, is the denigration of Moses' character in maintaining that he willfully forged the Biblical documents. On the other hand, the study of textual criticism is both patur and muttar, for, as we have seen, such criticism was at times resorted to in the Talmudic age. Modern Bible Criticism does not suggest that Moses forged the documents but that they are not the work of Moses at all. This, because it is in opposition to the established traditions of our people, is assur 'forbidden', but not hayyabh. Hence, Hirschenson concludes it would not be necessary for the orthodox Jew to boycott the Hebrew University because some of its Professors espouse the cause of Higher Criticism." To expand on these words, the responsum begins by noting that as in all areas of Jewish law, there are subtle distinctions between different acts, as in hilkhos shabbos. For example, there are those things for which a person is hayav. There is patur aval assur. There is patur and mutar. He proceeds to explain how these distinctions apply to Bible criticism. In the category of patur aval assur is higher Bible criticism, that is he says that this or that part of the Torah was taken from another place, wasn't written by Moshe, etc. While this is a very bad thing, and is prohibited he is not hayav kares, nor he has not forfeited his heleq in olam habah. But it's a very bad thing. Similarly, with lower Bible criticism, a textual critic who investigates the history of the text of the Torah who plans to establish a text which is different from the present one (contra R. Jacobs who does not note this distinction, but only the one below). In the third, patur and mutar, he places a textual critic who has no plan to change anything, but he uses critical tools for better understanding the text, or even to study Higher Criticism for the sake of knowledge, which is a good thing since it enables one to answer the epiqoros. This is no different from the Rambam's study of Greek philosophy, which contained good things and also many things that contradict religion and need to be rejected. This would be forbidden to teach children, but grown men who are university students are capable of making distinctions and can handle this material. Finally, a fourth category, which is both a mitzvah and obligation: to become learned in massorah and dikduk, as this is an exalted practice of our forbearers and it strengthens the Torah. For more on R. Hirschensohn (who was an associate of Ben Yehuda), see. This teshuva and a lot more fascinating discussion can be found toward the end of מלכי בקדש חלק ב. During the war of the revolution, two british soldiers broke into the Synagogue in Mill Street, and Stole the remonim; destroyed two of the Seapharim,* and threw them into the sink; the Soldiers were apprehended and Severely flogged, one of them died from the effects. * One of the above Sepharim was on Ivory rollers and belonged to the late Mr. Uriah Hendricks, & the other to the Congregation. From "Naphtali Phillips, pg. 216, PAJHS Journal 21 (1913). In this book from 1955 there is a photo of one of the scrolls, which was still kept in the ארון הקודש, and perhaps still is today. Unfortunately I don't have this photo at my disposal, but the Torah looked wrinkled (like it had been wet) with two or three holes with blackened edges. Edit: A. posted a translation of this letter: link. In truth, Ari should have written this post. But, instead I did. This book, תורת שפת עבר: ללמד בני ישראל דרכי לשון הקודש ומשפטיה, published in New York in 1904, was written by Simon Hertz, the father of Rabbi Joseph H. Hertz (1872-1846). He lived from 1846 to 1913 (see) having emigrated to the United States from Slovakia in 1884 (see). According to Meirovich's book on the Hertz Pentateuch, he was a musmach of R. Esriel Hildesheimer in Eisenstadt (where the latter resided prior to being run out of town by zealots the establishment of the Rabbinerseminar in Berlin). Letters of the "Holy Tongue"
Should strive to know the same. These אהוי"ן 'tis hard to explain. To a display of vowel-lessness. There are a few interesting features of this Hebrew grammar (in English with Yiddish on facing pages). For one thing, although the author calls the Yiddish language 'Jewish-German' in English, he calls it אשכנז in Hebrew. For another, in Solomon Schechter's הסכמה (see below) rather than Yiddish or Jewish-German, it is called 'German. '* Make of that what you will. Also interesting is the list of patrons who donated $10, $5 and $3 towards publication of the book (funds total less than $300). I would like to thank everyone who posed suggestions for new posts. Thanks on two counts; one, for the ideas themselves, and two, for showing interest in this blog. It may soon be time to reflect on this blog and to revisit my "Who am I" page. But first, a short thought. "I wish you all the luck in the world in cultivating intellectual curiosity in Flatbush and among frum people in general. Decades of experience have shown me how difficult a task that is. Good luck!" On the other hand, a mere three years experience has shown me that much that could not be accomplished from within the ivory tower can be accomplished from without. Please don't think of this as any sort of condescension, veiled or otherwise, toward my readers and blogging chaveirim. On the contrary, many people who know a lot more about the things I'm interested in and have known them for a lot longer than me seem to read this blog and contribute to the comments. But not everyone in 'Blogistan' fit that description, and I'm happy to say that you can cultivate intellectual curiosity among frum people, to say nothing of the curiosity which is already there. This funny poem by Jacqueline Osherow is from her Dead Men's Praise, a book of poems "address travels in Italy, the vanished Jewish world of the Ukraine, and insights into the nature of God that can be gleaned from the Hebrew psalms." By the way, I'm always so critical of Artscroll, but the distant dove of silence sounds perfectly poetic to me, not that it seems to actually mean anything. Upon michtam. Who decides when it's a michtam?